This recipe is a great example of how you can make a really great tasty meal, last minute out of stuff you’ve got leftover in the fridge/freezer and from a few store cupboard ingredients. I planned to be out all day on Saturday and didn’t really know when I’d be home or if I’d be eating out so I didn’t leave anything out to cook. I turned out to be in with plenty of time to cook up a good dinner so I started rummaging around for something to make. 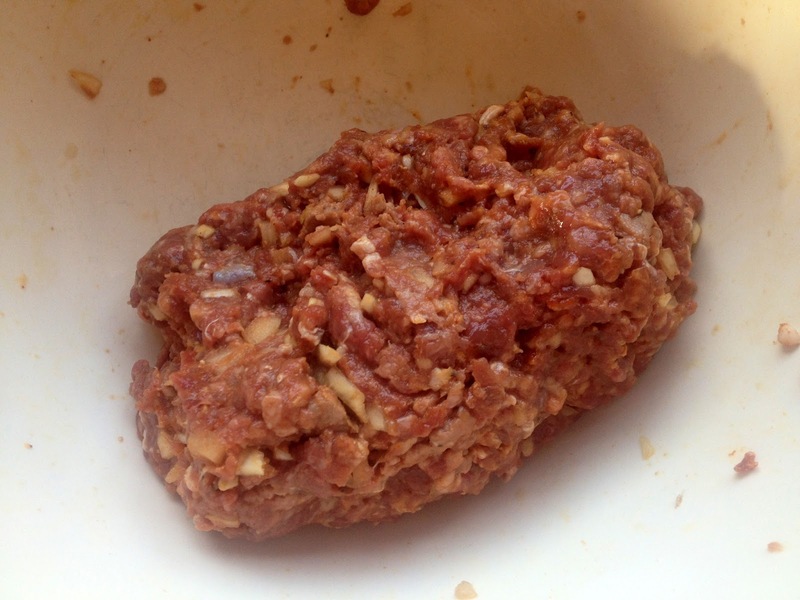 I always have mince in the freezer, and the only other meat in there was a few large joints for Sunday roasts. 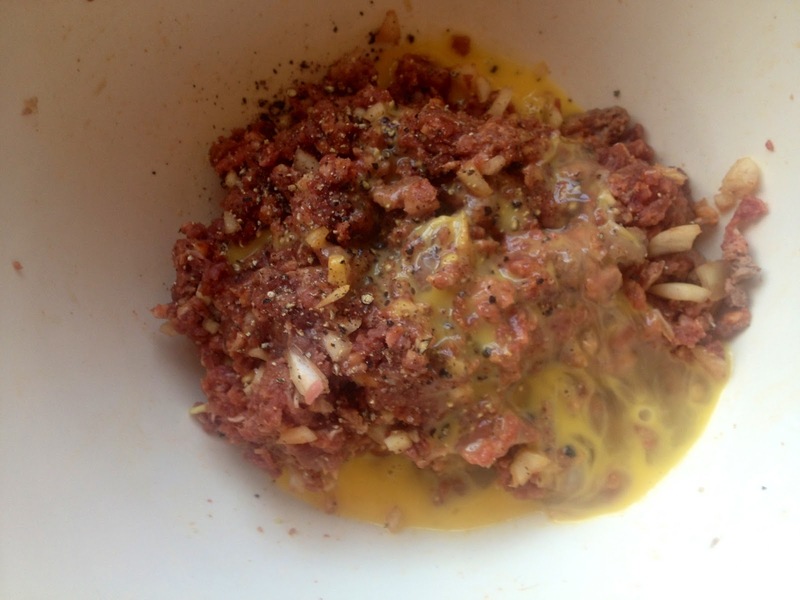 I grabbed some of the mince to defrost and got to thinking what I could do with it, besides your standard bolognese or chilli. 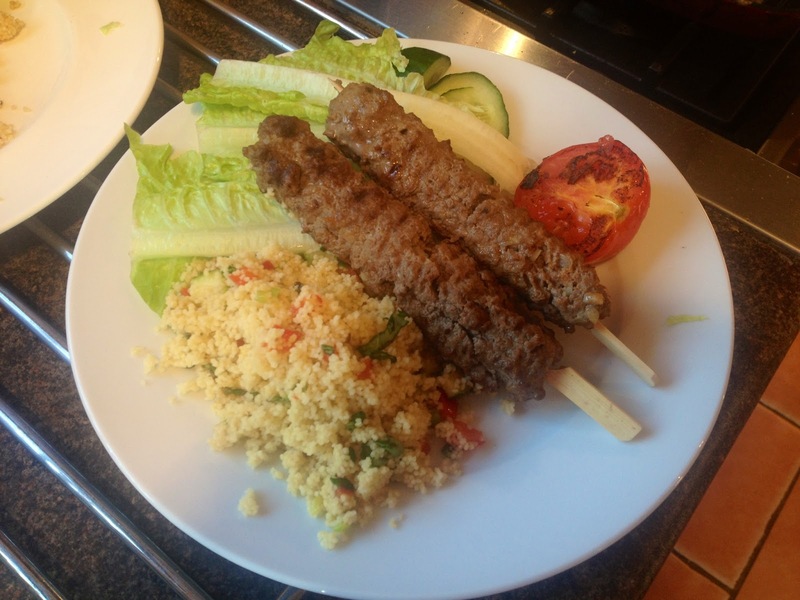 The hot summery weather called for something a little lighter so I decided to make it into kebabs, flavour it up a bit with some bits from the spice cupboard, use up the veg in the fridge to make some cous cous and use up the lettuce for a side salad. This makes four kebabs and I slightly underestimated how large they would be so we had two kebabs each, which left me absolutely stuffed. One kebab each is plenty for a sensible sized portion if you want to feed four. 1. Put four wooden kebab skewers in a glass of water to soak. This prevents them from burning when they’re on the grill. 2. 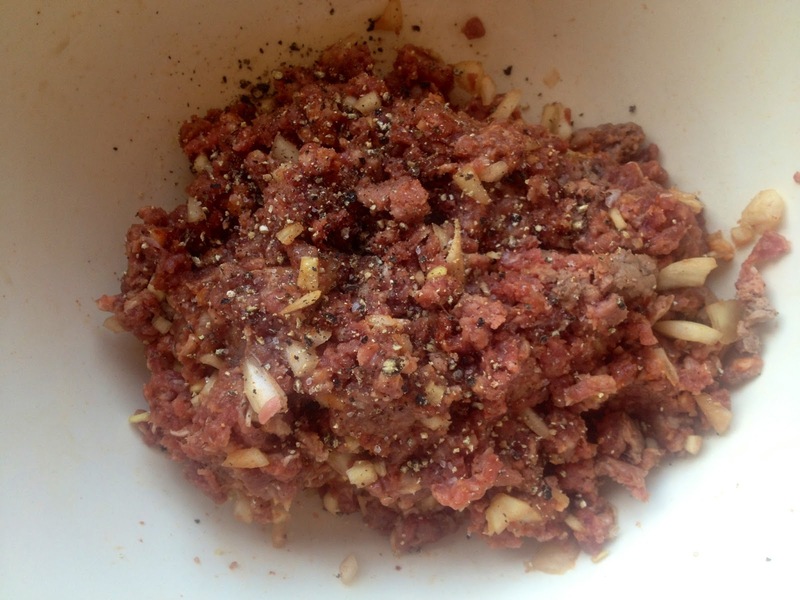 Mix together in a bowl the mince meat, onion, garlic, paprika, chilli powder and coriander. It’s easiest to get stuck in and do this with your hands. Season generously with salt and pepper. 3. Add the egg and mix through, the mixture should then become quite easy to mould into shapes. 4. 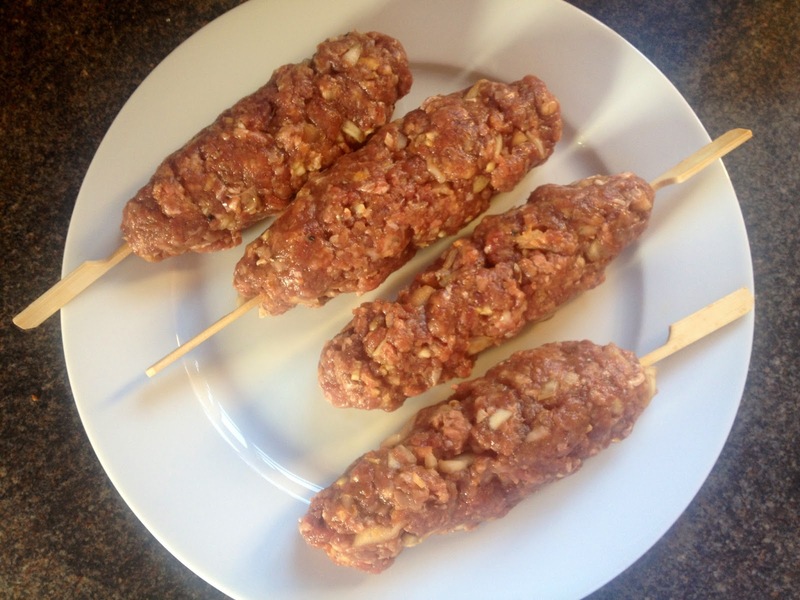 Mould the minced meat mixture around the skewers in a lollipop shape. Cover and leave in the fridge for half an hour to solidify the mixture a little bit. 5. Put a griddle pan on a medium to high heat and add a little oil. When hot, lay the skewers on to grill. This could alternatively be done on the barbecue. 6. 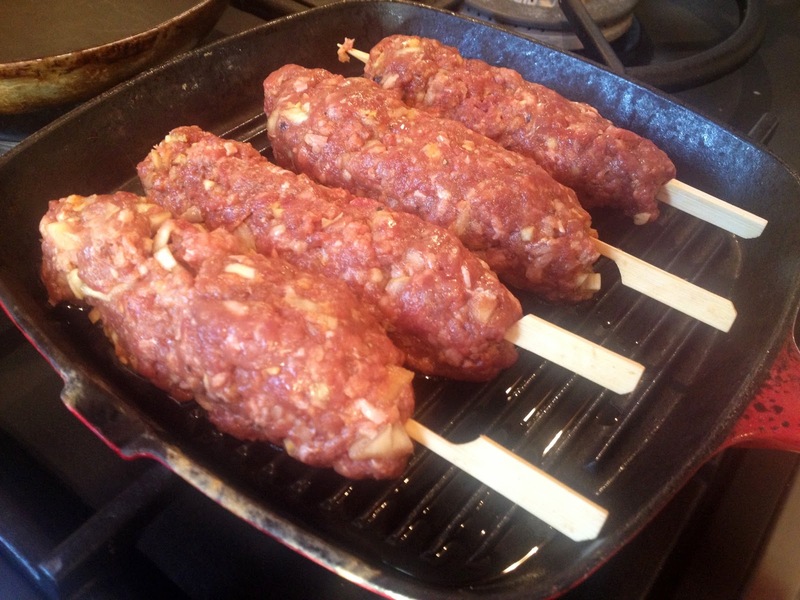 Keep turning the kebabs every couple of minutes to ensure they cook evenly on all sides and don’t stick to the pan. They should take around 15 minutes to cook all the way through. 7. In the meantime boil the kettle to make up your vegetable stock and put your cous cous in a bowl. 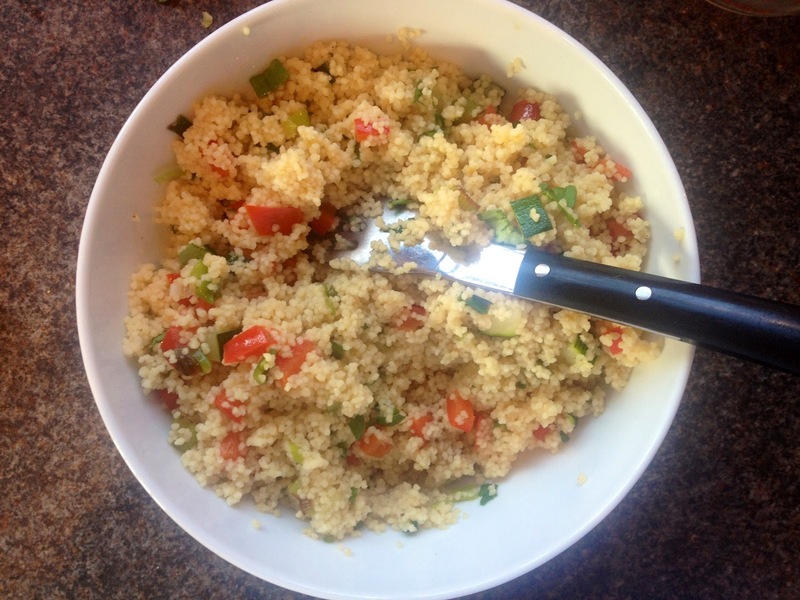 Squeeze the lemon juice into the cous cous. 8. Heat some oil a small frying pan and gently fry the diced pepper and courgette for approximately 3 minutes until softened. 9. Use the boiling water to make up the stock and pour into the cous cous. Leave to soak and the cous cous will absorb all the stock. 10. When all of the stock has been absorbed stir the cous cous with a fork to fluff it up a bit and mix through the pepper, courgette and basil. 11. When your meaty lollipops are brown and cooked all the way through dish up with the cous cous and some salad on the side. I grilled my tomatoes but you can just slice them up fresh if you’d prefer. This would be great with a little tzatziki, soured cream or maybe some sweet chilli sauce spooned into the side for a bit of dipping. If you’re having dips, you could also lightly grill or toast some pitta breads to have with it.